This year at Origins, I split my time between serving as a dungeon master, and playing in Dungeons & Dragons games. Remember the disappearing McFly family photo from Back to the Future? It gave Marty McFly a look at his progress toward setting his future right. This year at Origins Game Fair, I ran an epic adventure that made me think of that photo. More on that later. For many gamers, the Origins Game Fair feels just the right size. Unlike Winter Fantasy, the convention offers diversions beyond non-stop D&D. Unlike Gen Con, you don’t face a city and a convention center crowded to the limit. In 2015, Gen Con brought 61,423 unique visitors to Indianapolis. Origins 2016 brought 15,479 unique visitors to the similarly-sized city of Columbus. At Origins, you can reserve a hotel room without winning a lottery and you can pay for it without winning a lottery. I arrived with two convention-created adventures on my DM schedule. ELMW 2-1 Tendrils in the Fog and ELMW 2-2 Mists of the Moonsea read well. They land characters in vibrant scenes that promise to excite players. Both adventures feature a good mix of role-playing, investigation, and combat challenges. ELMW 2-1 takes players to villages and hideouts along the Moonsea, before ending in a small dungeon. ELMW 2-2 features battles on and under the sea, and ends with an ambush spanning a series of rope bridges. 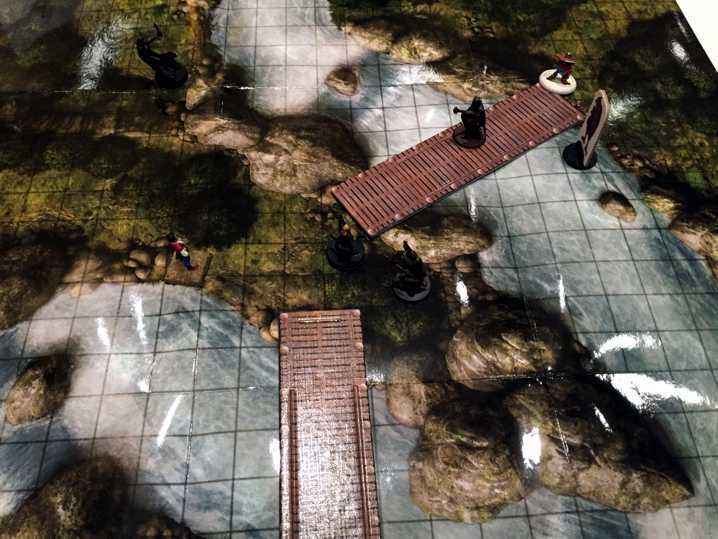 Both adventures pit the players against a group of adventurers cursed by evil. The foes resemble any number of morally questionable parties, perhaps dialed one notch darker. I loved these villains. ELMW 2-2 proved as fun as I anticipated. I never ran ELMW 2-1 because the marshals needed an extra hand to run the introductory adventures for Tomb of Annihilation. I ran these adventures cold, reading one step ahead of the players. Each of this set of 5 missions plays in hour and a half or so. These adventures take characters to the jungle of Chult and the exotic Port Nyranzaru. Chult substitutes dinosaurs for shining knights and blood-sucking vines for wizards in pointy hats. Players feel like Indiana Jones in a lost world. Most of the folks who come to play D&D at Origins rank as passionate players who bring a quiver of characters and who may play adventures more than once. The introductory adventures draw a different mix of players. First-timers and gamers who haven’t played since THAC0 join the D&D enthusiasts. The new and returning players bring a fresh enthusiasm that I savor. In the past, I haven’t volunteered for these introductory adventures, but next year, I plan to. At conventions like Origins, where the dungeon masters belong to the Heralds Guild, we get scored based on players’ feedback. Running the introductory adventures cold lead to a dip in my score for preparation. I can’t argue with the accuracy, but seeing a drop in my overall judge scores disappointed me. This year, Origins hosted all three of the epic adventures that accompany Tales from the Yawning Portal. I played in Hecatomb, an epic for tiers 3 and 4. Hecatomb’s author ramped up the difficulty of this adventure, even for tier 4. I love a challenge, so I welcomed the threat. I heard tales of tables practically wiped out. Meanwhile, at my table, two characters died, rose as undead, and attacked surviving players at other tables. One of the DMs administering the event went from table to table with a group of players running their now-undead PCs. The dead took revenge on the living. This “interaction” beats just having some evil champion roaming from table to table. Hecatomb landed all the players on massive battlefield, scrambling to destroy arcane obelisks while fighting monsters. Presumably, our comrades in arms fought on battlemaps next to ours, facing other battles for other obelisks. By social convention, everyone agrees not to seek out the folks at the next table to form a party of 12. Our party featured a crossbow expert/sharpshooter character—number 1 on my list of character types absurdly good at one thing. Even folks who play the combination find it overpowered. After taking casualties, our table changed strategy. We realized that the sharpshooter could safely destroy the obelisks and the monsters lurking two maps over, without ever letting threats come close enough to strike back. In this optimal strategy, my magic user’s best contribution was to cast Haste on the sharpshooter. Our melee characters could only “ooh” and “ahh” like an audience for Annie Oakley. Encounter designers need to consider sharpshooting just as they might consider something like flying. If you design an encounter where characters can engage foes from 500-yards away, then for parties with sharpshooters, the monsters resemble infantry crossing no-man’s land. I ran Return to White Plume Mountain as a dungeon master. This epic accommodated both tier-2 and 3 characters. The tier-3 PCs fought to thwart a sacrificial ritual, while the tier-2 PCs attempted to distract the monsters, drawing them away from the main assault. Return to White Plume Mountain worked hard to foster interaction. Some of its methods fascinated me. A twist that required communication. Return gave each party a sending stone linked with another table. In many epics, such stones enable communication, but Return also included a clever trick that could foil groups who failed to communicate. In my session, some tables treated messages as a distraction and failed to notice the essential information. If more solutions come from messages between tables, the design would work even better. Scoring that affected encounters for both tiers. Return featured a push-pull dynamic where each tier’s efforts drew monsters away from the other tier. Potentially, this could force tables to agree on a strategy that raises enough of a distraction to ensure success without drawing all the monsters into a deadly encounter. In practice, tier-2 tables just saw a distraction score that they could raise. Like any good gamers, they put all their energy to reaching a high score. Tables marched through the dungeon making more noise than a parade, without seeing the danger. In the end, tier 2 faced all the monsters. The push-pull feature would work better if, instead of a rising score, the players saw the additional monsters in their future. Suppose some divination magic gives the PCs visions of their near future. This idea made me think of the McFly family photo—a vision of the future that results from the players’ current actions. I wanted a line of miniature figures that showed the monsters to come, but a scorecard handout would work as well. Back in How to forge the most epic multi-table role-playing event ever, I recommended letting players choose their own difficulty. In Return, a more visual push-pull mechanic would help. Every table joined in the same battle. In the finale, all the tier-2 parties enter a massive dungeon room where they spot the ritual at the far side. An army of tier-3 monsters defend the ritual. As intended, the tier-2 parties stay on their side of the room and work to rescue sacrificial victims until tier 3 arrives near the heavy hitters to thwart the ritual. This works so long as the Tier-2 groups stay in their lane and avoid any bold ideas that might interfere with the ritual. Step aside, pipsqueaks. I’ll finish this. When I ran, my tier-2 group had little reason to stay in their lane. Before entering the final room, tier-2 table captains gather to share resources. Somehow, my table’s captain returned from the meeting with an allied planetar summoned by a tier-3 table. So a party clustered around level 7 added a challenge-rating-16 powerhouse with a fly speed of 120. I spent days wondering what part of the adventure let tier-3 tables share such resources with tier 2. What did I miss? The event’s one administrator was doing a job intended for three people, and I think he overlooked this extra interaction. But at the time, I figured the planetar came approved by the boss. My players stayed in their lane. I’m not particularly happy with the way I handled the situation. How would you do it? In eight hours, the D&D Open aims to combine the fun and community of a battle interactive, with a measure of the competition of the old tournaments. The Open’s all-star team of authors, Teos Abadia, Shawn Merwin, and Sean Molley, capture all the challenge that made the original event such a blast. This year, I played as groups ventured to the jungle land of Chult to rob the tombs of dead gods. Monsters native to this lost world provided a unique flavor. 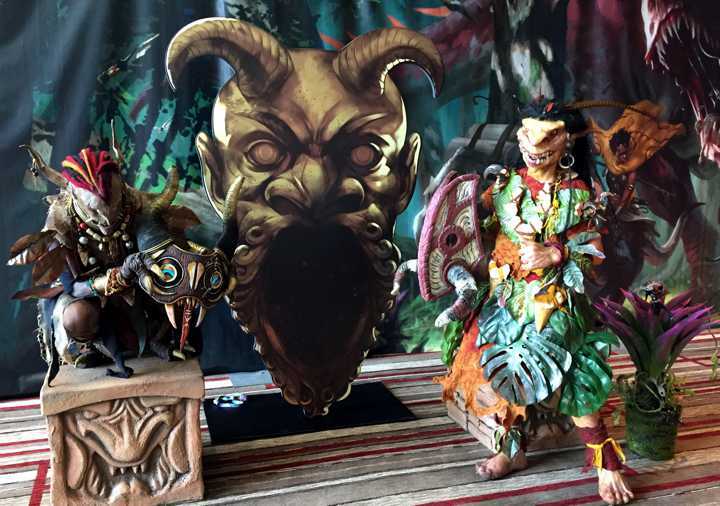 The event added a room of physical and mental challenges for Players—something like dungeon carnival games. Everyone seemed to enjoy this short break from the table. The adventure also added the shtick of having a wandering monster roam from table to table to trade attacks. I only like this trick when the wandering menace comes from now-undead PCs. In a quasi-competitive event where players race against time, I disliked the gimmick more than usual. Fortunately, the interruption only takes a few minutes. The event’s finale featured clever twist and a thrilling race to escape. The escape encouraged even faster play and set an objective other than kill everything. Once again, the D&D Open delivered the year’s best D&D game. This entry was posted in Conventions and tagged Adventurers League, Battle Interactive, D&D Championship, GEN CON, Heralds Guild, Origins convention, Sean Molley, Shawn Merwin, Teos Abadia, Winter Fantasy. Bookmark the permalink. Just wanted to weigh in…and apologize….for summoning…the Planetar. My whole table’s jaws dropped at that. 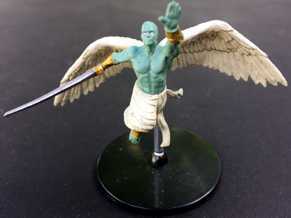 What had gone from just a hope to provide an ally to assist had turned into an angelic being that could break the entire Epic, as you wrote about. So again, I am so sorry for throwing that ridiculous celestial monkey wrench into the works of your table. Honestly, this wackiness is what makes the events truly fun. That it can go upside down and sideways is part of what makes Epic events different and memorable. It is less important for me what the DM decided to do and more important that a decision had to be made – that’s what tells me the event is Epic. If it were me… I would want this to have a multi-table impact. Having run these often and written a few, as a DM I might come up with an idea and float it by the admin. First, I would ask the table what they want to do. Send the Planetar to stop the ritual? Cool. How about it goes there, and as a result one for is pulled from each Tier 2 table as the evil forces have to pull back and deal with the Planetar? And maybe the admin can explain what is happening, with the Planetar and Villain going at it. There could be a tier 3 impact 2. Maybe the evil gods step in, not liking celestial involvement. A fiend appears, and maybe tier 3 can expend resources to keep the Planetar alive? In general, I want as DM to honor the table’s vision while keeping the event crazy and epic. I’m really glad you liked the Open, David! We had a blast writing it! The traveling monster… that was a bit of an afterthought, to heighten the presence of those kinds of monsters across the event. I wrote the bit, and my hope had been that the inclusion of the pillar would make it feel different. I think it did, but when I ran it (WotC had me run it for the table streaming the event) I wasn’t satisfied with the mix of combat and pillar interaction. It’s food for thought, and I’ll be thinking on how to further step away from “flavorless bag of hit points and attacks shows up.” I think such wandering monsters have become stale, and we need new approaches to make them more interesting. I appreciate hearing how it went at your table. Writing the Open has been one of the greatest pleasures of my freelance career. I never will get over how fortunate I have been to play a hand in the events, even though they are absolutely exhausting! Any advice for running hecatomb? How does it connect to TftYP? Our tables (tier 3) were being hurt bad, I think the instruction is vague, especially when being yelled from the corner of a large room. I tried to explain the best I could to my table. I was asked what help my table needed, and i asked for spell slots! Alas there is no mechanic for hranting spell slots so my party relied on cantrips. In the end an allied wizard (admins I believe) was sent to help by casting one spell from her list.